WASHINGTON (CNN) -- Millions of White House e-mails may be missing, White House spokeswoman Dana Perino acknowledged Friday. "I wouldn't rule out that there were a potential 5 million e-mails lost," Perino told reporters. The administration was already facing sharp questions about whether top presidential advisers including Karl Rove improperly used Republican National Committee e-mail that the White House said later disappeared. "This story is really now a two-part issue," CREW's Melanie Sloan told CNN. "First there's the use of the RNC e-mail server that's inappropriate by White House officials and secondly we've also learned that there were between March of 2003 and October of 2005 apparently over 5 million e-mail that were not preserved and these are e-mail on the regular White House server." Perino stressed there's no indication the e-mails were intentionally lost, but she was careful not to dispute the outside group's allegations. "I'm not taking issue with their conclusions at this point," Perino said. "We're checking into them. There are 1,700 people in the Executive Office of the President." Perino's disclosure about the White House e-mail comes a day after she admitted that the White House "screwed up" by not requiring e-mails from Republican Party and campaign accounts to be saved and was also trying to recover those e-mails. Perino said 22 aides in the political arm of the president's office use party or campaign e-mail accounts, which were issued to separate official business from political work. Some of those accounts were used to discuss the December firings of eight federal prosecutors, a shake-up that has triggered a spreading controversy on Capitol Hill. Congressional investigators have questioned whether White House aides used e-mail accounts from the Republican Party and President Bush's re-election campaign for official government business to avoid scrutiny of those dealings. Sen. Patrick Leahy, the chairman of the Senate Judiciary Committee, accused the White House of trying to hide messages on the Republican Party system related to the firing of the U.S. attorneys, which has stirred up a hornet's nest on Capitol Hill. Leahy said the e-mails would have remained on party or campaign computer servers, and he compared the situation to the famous 18½-minute gap in one of the Watergate tapes. "They're there," he said. "They know they're there, and we'll subpoena them, if necessary, and we'll have them." Perino told reporters that the e-mails from those accounts should have been saved, but said policy has not kept pace with technology. She said computer experts were trying to retrieve any records that have been deleted. "We screwed up, and we're trying to fix it," she told reporters. Patrick Fitzgerald, the special prosecutor in the CIA leak case, disclosed last year that some White House e-mails in 2003 were not saved as standard procedure dictated. In a January 23, 2006, letter to the defense team of former White House aide I. Lewis "Scooter" Libby, Fitzgerald wrote: "We advise you that we have learned that not all e-mail of the Office of Vice President and the Executive Office of President for certain time periods in 2003 was preserved through the normal archiving process on the White House computer system." Robert Luskin, personal attorney for Rove, told CNN Friday that he "has no reason to doubt" Fitzgerald's assertion that some White House e-mail was missing. "You're quite right," Luskin said in a telephone interview. "There was a gap there." Democrats charge this raises questions about whether the public has gotten the full story on everything from the CIA leak case to the fired U.S. attorneys controversy. "The biggest problem here is really that here is a White House that is deliberately violating an existing statute that requires them to preserve all records," said Sloan. "And we have significant evidence now both from the RNC e-mail and the White House e-mail that are missing that the White House was using every means possible to avoid complying with the law." Luskin said it was "foolish speculation" for CREW -- which serves as counsel to former ambassador Joe Wilson and his wife, Valerie Plame, in a private suit against Rove and other Bush officials -- to suggest that the gap in White House e-mail helped Rove avoid indictment in the CIA leak case. Luskin said Fitzgerald told him that Rove was cleared in the case because he "did nothing wrong." Luskin added that until this month, Rove believed his RNC e-mail was being archived and did nothing wrong. 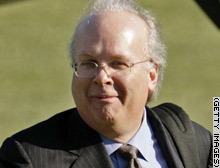 "Rove has always understood from very early on in the Bush administration that RNC and campaign e-mail were being archived," said Luskin. "He was absolutely unaware until very, very recently that any e-mails were lost. And he never asked that e-mails be deleted or asked for the authority to delete e-mails." CNN's Ed Henry and Lisa Goddard contributed to this report. The lawyer for Bush aide Karl Rove said that e-mails sought by the CIA leak prosecutor were also missing.